Getting to Know You: English Class Student Survey Set! Are you looking for ways to build relationships with your students from day one? 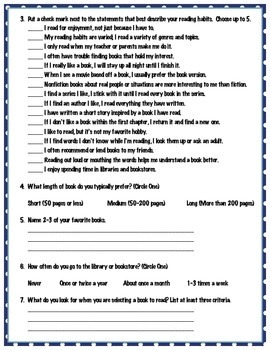 Are you interested in learning more about their reading habits? Would it be helpful for you to know more about how your students view themselves as learners? 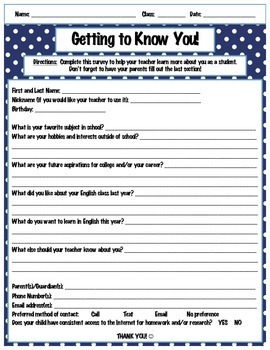 Save yourself some time and use this comprehensive survey packet on the first day of school! It's quick, easy to implement, and will provide great insight into what makes your students tick. ~ A general demographic and interest survey that includes hobbies, future aspirations, and parent contact information. 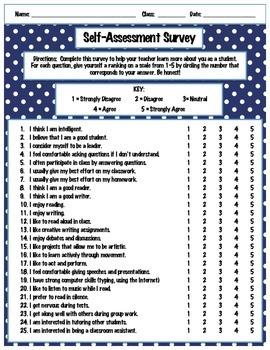 ~ A Likert-style self-assessment that addresses learning habits, styles and preferences. 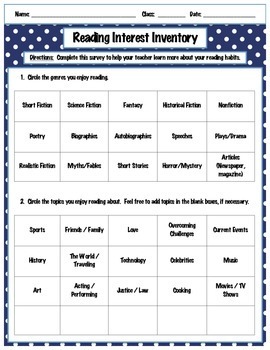 ~ A reading interest inventory that asks students to indicate favorite genres/topics and to describe their current reading habits. For best results, have students complete the packet for homework and share their responses in class the following day. Four corners, "Stand up if", and Partner Shares all work well! Enjoy!